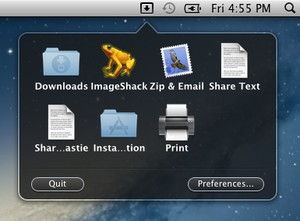 Dropzone (Mac App Store link) is one of those things you don’t know you need until you use it. At it’s simplest, Dropzone lives in your menubar, and expands to a palate of actions, whether that’s compressing a file and emailing it, or uploading a picture to your Flickr account. Performing an action is as simple as dragging a file to Dropzone, or clicking the action in the Dropzone interface. Choose from a wide variety of built-in actions, or add your own from an extensive list of user-built actions at Aptonic’s website. To make Dropzone even easier to use, the Circles feature let you keep a few frequently-used actions accessible from the Desktop. Dropzone is simple, elegant, and now I can’t work without it. Dropzone is quick and intuitive, and the variety of optional actions will be a boon to any workflow. Dropzone can make certain tasks within reach of a simple drag-and-drop action.